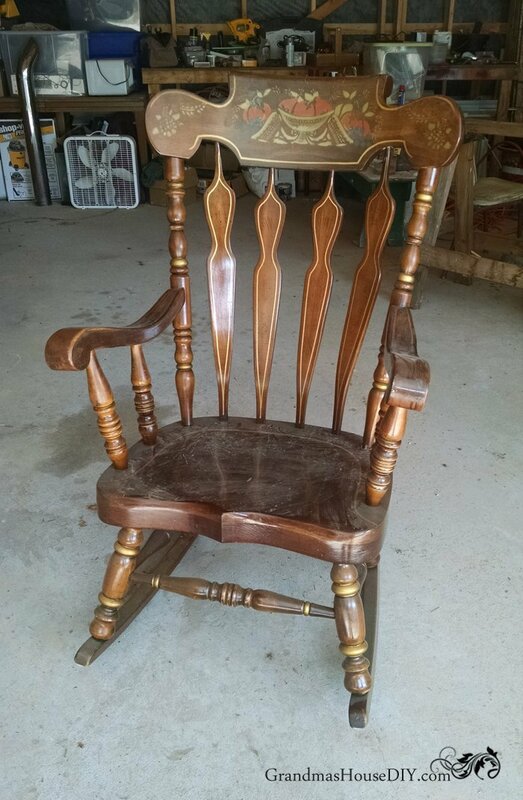 Painted Rocking Chair – From dated to stunning! I scored at an estate sale a while back, picking up one painted rocking chair, another chair with a matching couch, two end tables and a coffee table for only $100 and, as you might imagine, I had big plans for all of it! You can read my post about when I picked them up here. I already completed the two end tables awhile back and I’m very happy to report that I still love them in my living room! Two end tables get a sweet country makeover. This last weekend I spent the ENTIRE day Saturday working on the painted rocking chair and the matching chair and couch and the coffee table. I had set out Saturday to get the painted rocking chair finished but as soon as I set foot in my garage, dressed in my work clothes and all ready to go, my heart sank and I called myself several four letter words. The rocking chair needed some wood putty fixes and fills in a couple of places and wood putty takes a VERY long time to dry. Dangnabit! Well, I wouldn’t be getting that painted rocking chair done that Saturday now would I!? Fortunately, like any good DIYer, there were other projects I could work on (isn’t there always?) So I got to work on the matching couch, chair and coffee table. Six hours later and they had two coats of primer, three coats of paint and I was ready to NEVER see my garage or a paint brush again. Someday I’m going to buy myself a paint sprayer and wonder forever why I hadn’t bought it SO MUCH sooner! I hate to admit that a lot of my paint choices are based on what I have on hand. (Paint is expensive!) I happened to have an almost-full can of black Rustoleum flat paint left over from painting my interior doors so I grabbed it for this painted rocking chair. The chair itself was sturdy and in really good shape but it needed a makeover BADLY. I sanded the entire chair down and got to painting. The thing is about oil based paints like Rustoleum they take a LONG time to dry. So, between coats on this painted rocking chair I touched up the entire matching chair, couch and coffee table set then put two coats of exterior sealant on it. Now, all I need to do is buy cushions and I’ll be able to call it done and show you guys my new outdoor furniture set!! I think it turned out really stunning and I think it would work in just about any home or porch whether for a nursery or just a place to rock with a morning cup of coffee or tea. This is truly the first step I’m taking toward my dream of refinishing furniture for a living, it is a very long term goal, but it is exciting for me to take the first step even if it is only a little one! Thanks, as always guys, for coming by!! That rocking chair is gorgeous now! I’m sure it will sell fast to someone with good taste. Love the rocking chair! I don’t know if you remember that I have written to you before, I am the gal that is from Park Rapids. I now live in Otsego/Elk River area and sell repurposed furniture on facebook garage sale sites and at an occasional shop in Buffalo. While I love the rocking chair, they just don’t sell, at least in this area. My popular pieces are usually small tables, nightstands and desks. Good Luck! Ok, this is stunning! 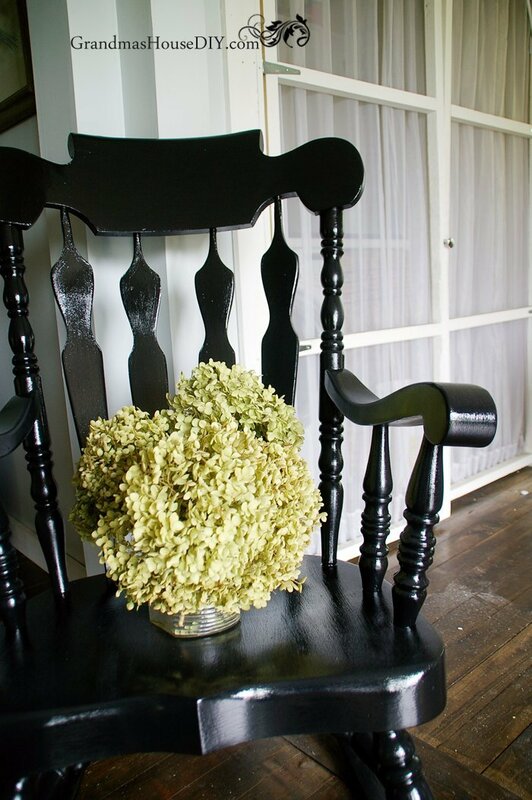 We have a rocking chair exactly like this & you’ve convinced me to paint it black. Yours looks gorgeous now! Oh Meg thank you so much!! I was worried about the black paint but once it was all done I was sold! This is truly stunning in black. I had a bi-centennial I passed on to my son that looks just like yours. Amazing transformation, Tarah! I just “rescued” our plain-Jane brown desk with a coat of black and I love it. 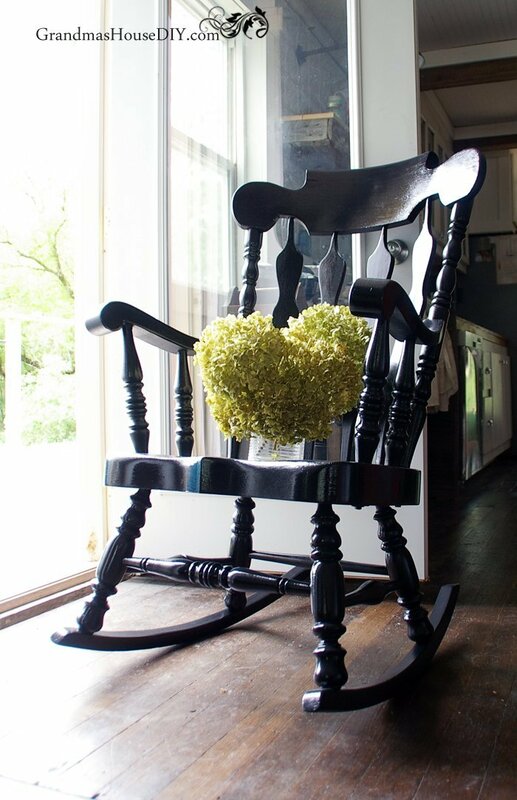 Thanks so much for linking up your rocker at Vintage Charm (hope it sells quickly!). Thank you so much Diana! Its been a few months now and I haven’t tried to sell it yet… my husband keeps mentioning that that was in fact why I purchased it and painted it… I didn’t expect to have trouble letting it go! It is stunning! Funny you sound so much like me! I always have some project to work and love that. 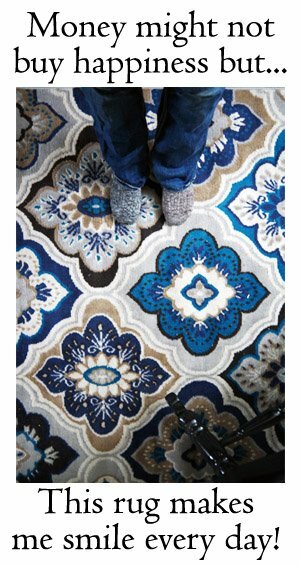 My husband is always like we have so many projects to do, and I say yes I love projects! I love that you painted it black! Stunning! I have a similar rocking chair that I bought when my son was born. I have thought about painting it but just haven’t done it yet. You are inspiring me to paint it. I always feel a little bad when I reach for the paint but I think in this case it was totally the right choice! Thank you Michelle, so far I haven’t had the heart to try and sell her yet but it is on my list of “to-dos”! What a beautiful difference! Thanks for sharing on the Pleasures of the NW’s DIY party! Congratulations! 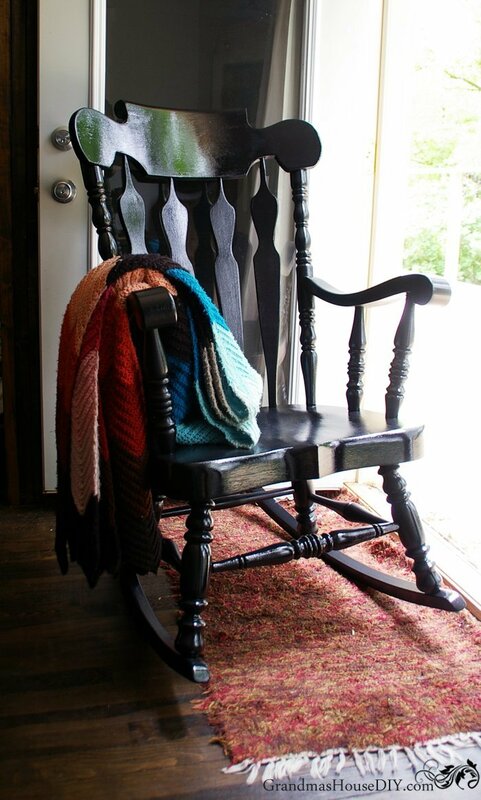 Your Rocking Chair is featured on this week’s DIY party!! Come by and grab a featured button tomorrow and thanks for sharing! That’s amazing! Thank you so much Helen! Stunning indeed! Thanks for sharing at Funtastic Friday! I have a rocking chair that looks very much like this. I had never thought of painting it black. All of our interior doors are painted black, so it would actually fit right in. thanks for the great idea! Deborah, I painted all of my interior doors black too, love the look! Thanks for coming by! I love the new look! Can you believe that I had a very similar rocker when my first child was born in 1973. They were all the rage back then. Sorry to say that I no longer have it. Thanks for sharing with SYC. I love the rocking chair, what a beautiful transformation!! Love the black color you used. Its such a great anchor color and timeless too! Your chair turned out so gorgeous! Thanks for sharing. What a beautiful transformation! Thank you for sharing at Celebrate Your Story! Happy Thanksgiving! Thank you so much Carla, it really was such a lovely chair! I’m like you, a lot of my paint choices are from what is on hand, which is usually what I find for free at hazmat. It does simplify the decision making process. Yup, sounds like me! But, you’re right, it does simplify the process a lot! I love the way this turned out! I would not have chosen black but it was really a great choice here. Love it! Thanks for sharing at the Family Joy Blog Link Party this week!! I just love the way this turned out. I want to get one to paint for my sister who’s having a baby in a few weeks! Thanks for joining the Family Joy link party! Samantha, that would be such a wonderful gift for your sister! Thanks for coming by! 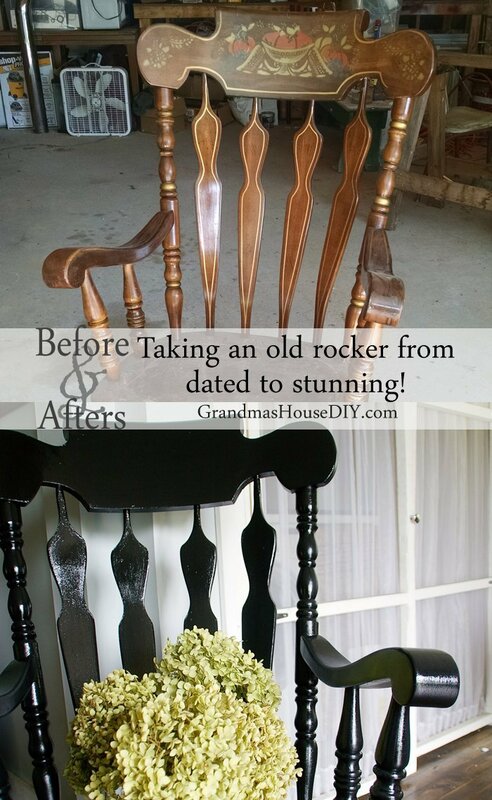 Love how your rocker turned out! Thanks for sharing at the Inspiration Spotlight party! Pinned & shared. What a beautiful beautiful makeover. Featuring you when my link party opens up tonight! Thanks for sharing. Gorgeous chair. I love the makeover! This is a stunning change and stark difference in the look brought about is super! Loved the colour and also the colours chosen! It never ceases to amaze me how a fresh coat of paint will completely transfer a dated piece – love it! It is just amazing what a little paint can do! Thanks! Wonderful makeover Tarah! 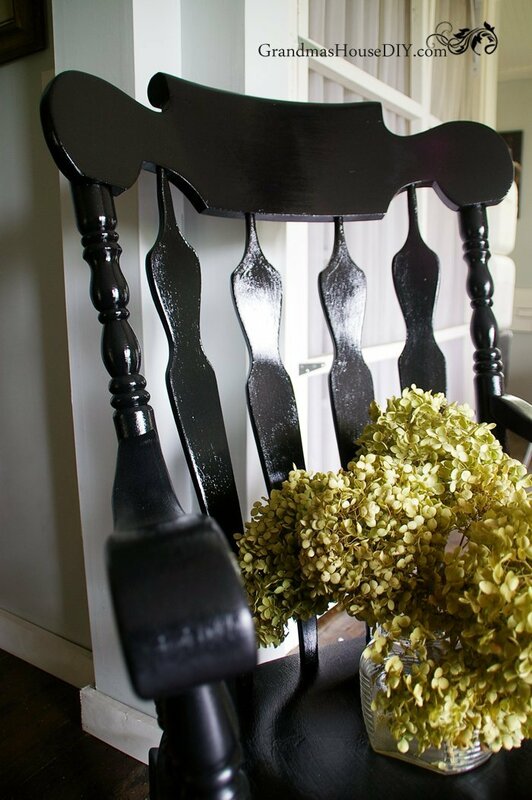 Black as a neutral sells really well and a great color choice for this piece, and perfect timing Porch rockers are a must in the south for those hot Summer afternoons! Thanks so much for sharing your project at Fridays Furniture Fix! 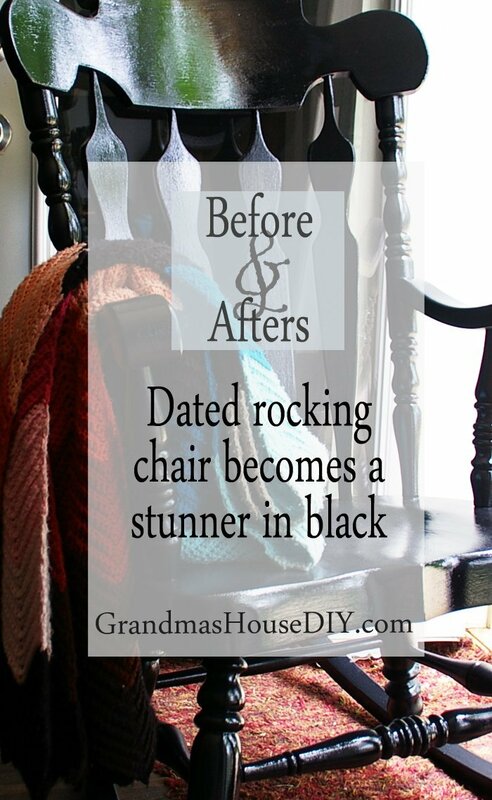 I have an old rocking chair that needs updating – I love the black on yours! Thanks Roseann! I just love these old rockers! OMG! I bought the same, outdated 70s rocker, today at the Goodwill. I can’t wait to start my refurbishing!!! I’m tired of going furniture shopping and not finding my taste, in quality furniture. Not to mention the price of specialty items. So I figure $8 for the chair, sandpaper and paint, and we’ll see how it goes!! Excited to start!! Thanks for the inspiration! Oh Brandy I am so excited for you!! Good luck! You did a wonderful job with that rocker. Very beautiful. The rocking chair turned out just fabulous. I expect it will sell. Everyone I have ever painted has sold. Can’t wait to see the other projects you have been working on. This chair will be so perfect for sitting out on a front porch. It reminds me of something from a movie set. Beautiful makeover, I love the striking black. I still have my similar chair, dubbed, “the Baby Rocking Chair.” Started rocking my kids in utero as I love rockers! I’m 5’7″ tall so I wanted a chair with a high seat and rugged arms to push off from when holding a baby. Couldn’t imagine trying to get up out of a low Boston rocker! One baby was 8 years old and he would still climb into my lap in that chair when he had a boo-boo! Those babies are 33 and 34 years old now! It was also a good place for a good cry–don’t have to do that anymore! Wish I had a big enough front porch! Your makeover was great. 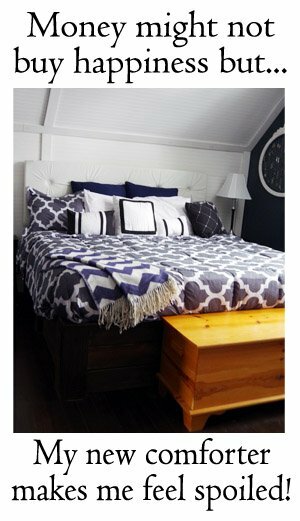 Being a color fanatic, I would put a hot pink cushion in it! It’s open all week & growing! It is surprising how much the black paint suits the chair…. much more than the original. 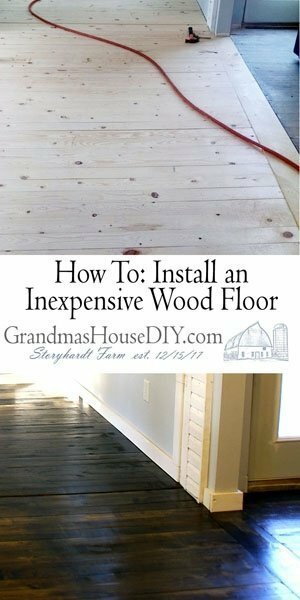 Just saw this on the Happiness is Homemade link party. Great job. I would have seen this rocker and totally passed it up. Turned out gorgeous! This is the kind of chair I wanted (and got) for a baby rocking chair. I started rocking in it with kids in utero; when Patrick was 8, he still fit in my lap and wanted a rocking when he had a boo-boo! He’s 34 now! The seat is higher than a Boston rocker and the arms are rugged so you can push off with one hand and a baby in the other! Can’t do that in those bentwood rockers with cane seats! It’s also man-sized so gramp can use it, too! I can’t imagine any other rocker to use with a baby; it wasn’t too shabby for a feel-sorry-for-yourself-cry, either! Kathy, I loved it when I first saw it because it was “man sized” so many older solid wood rockers that you run into at thrift stores etc are just TINY. This one was heavy and solid and could hold a full sized guy! I have four other rockers (I’m hoarding rocking chairs, its fine.) but this is literally the only one that can hold a regular guy so I keep it in my living room. Lovely to hear your story, thank you for sharing with me! What awesome memories! I love the look! Well done! Your rocker truly is a stunner. I am a sucker for black painted furniture. I wish you all the success in the world with your furniture refinishing business! Thank you so much Holley! Tarah, that is such a beautiful rocker. I can’t wait to find me one like it! It looks so much better now, you did a great job. Thank you for sharing at The Really Crafty Link Party. Pinned!